Grant McCann on Sunderland as George Honeyman set for a recall? Tuesday night football makes another welcome return to the League One schedule, making the games seem almost relentless. 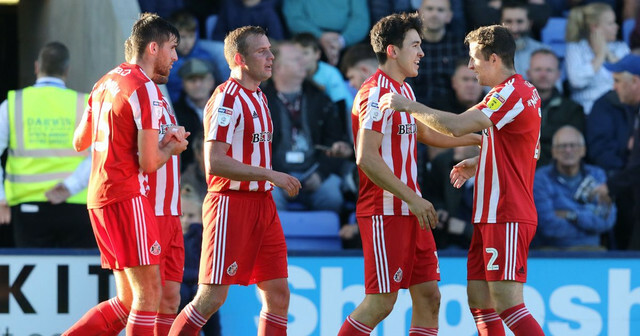 Sunderland overcame Shrewsbury Town at the New Meadow Stadium on Saturday to help solidify a definitive bit of momentum. Tonight sees Jack Ross take his team to Doncaster Rovers who sit in sixth and have had some impressive results this season. Sunderland came up against an extremely competitive Shrews side on Saturday and were made to look poor in the first half. Too many long balls allowed Salop to feed their pacy wingers who tried to whip a cross in wherever possible. Sunderland's back four of Matthews, Flanagan, Baldwin and James held firm but some were guilty of being wasteful with the ball. Half time came and went and once the second half was underway Ross intervened to turn the tide. Aiden McGeady had flickered rather than sparkled and Josh Maja was having an off day. Their replacements Lynden Gooch and George Honeyman had instant impacts, their tenacity and more direct play causing chaos for the Shrewsbury defenders. The own goal came from a Gooch cross curling into the box and the second from a neat one two between the American and late substitute Luke O'Nien. Back to back wins and a second clean sheet. Doncaster have enjoyed an excellent start to the season picking up some big wins against promotion rivals in the process. A 2-1 win over Luton and then going on to smash Walsall 4-1 away springs to mind. Manager Grant McCann is certainly getting the most out if his players with striker John Marquis having a particularly fruitful season thus far, bagging nine goals putting him joint top scorer in League 1 among others, including Sunderland's Maja. On Saturday they played out a thrilling 3-3 draw with Gillingham and will be hungry to take full spoils come the full time whistle. McCann has his side playing attractive football and it will be interesting to see who comes out on top when the two passing sides clash. Ross is well aware of the quality that Doncaster possess on the ball but seems to be relishing the challenge. "A team that’s obviously had a good season to date, consistently good, obviously they’ve remained in the top five or six positions over the course of the season. John and James watched them earlier on in the season and were really impressed and everything I’ve seen of them, I think they play in a really positive manner in terms of how they pass the ball. "Maybe that’s good for us tomorrow because we’ve came against different styles this season. But, everything I’ve seen of Grant and his team, has been a team that tries to go and play football. I think the stadium and the environment will be one that we will enjoy tomorrow as well. I expect a difficult game against a team that to be where they are after 13 games, they can only be a good side." McCann on the other hand is backing the Black Cats to win the league on the back of their superior budget. "They'll have one player on more money than my whole team - I know that for a fact. They're a huge club for this division. They should be running away with the league really, with the budget they've got. "This season, I think generally League One is more of a level playing field - apart from Sunderland and Barnsley. "Barnsley have a squad that they've put together for about £10m and their XI that they put out every week is worth about that. It's a Championship team, so those two are head and shoulders above everybody financially." Sunderland arrive at the Keepmoat Stadium with a slightly healthier squad than the one that faced Shrewsbury on Saturday. Gooch and Honeyman are back fit, Gooch will certainly be drafted into the starting line up after his undeniable impact on his return. Maja will be fit enough to start despite an ankle niggle, leaving the only real decision as whether or not to start Dylan McGeouch or George Honeyman. The Scottish international has an impressive calibre of skill at his disposal, but it needs to be coming to the fore regularly in order for it to benefit Jack Ross's game plan. Doncaster are set to be without their young Liverpool loanee Herbie Kane after the midfielder left the pitch early in the second half with a dead leg against Gillingham. I expect two teams who like to keep the ball on the grass probing eachother for chances. Both have players of quality and both have a proven goal scorer in their ranks who are hungry for more. The difference could well be the sold out away end, but it's sure to be nail biting. If Sunderland can start to undo the Doncaster back four and create some chances they could eek out a similar result to Saturday. Baldwin and Flanagan seem to cope slightly better with teams of a passing style. 2-0 again to keep the momentum going.